As long as I can remember, I have loved maps. In the similar way that people are drawn to movies or books as a means to escape, maps offered me a path to mystery and wonder, to a place beyond me. I remember diving into old National Geographic maps, tracing my finger along a blue swirling, curving line as it wound its way through green tinted jungles and dark brown canyons to a jumbled unpronounceable town straddling a distant sea. I was an explorer for a day. And there was always something about unfolding a crisp new AAA map: the anticipation of discovery? Planning out a new future? Traveling away to anywhere that wasn’t here?! When I was little, my Dad and I would draw road maps on napkins, concocting bizarre towns with endless roundabouts and triple decker highways. When we went to the shore, we would build our own 3D maps in the sand with real tunnels and mountains and lakes and roads. Of course I would later do the same with my own kids, who never failed to shout with joy when our stretching, wiggling finger tips magically met beneath the sand as we tunneled from opposite sides. Predictably, at the end of the day, we’d helplessly watch as the ocean waves dissolved our cartographic playground. One of my favorite books as a teenager was James Michener’s The Drifters, about six young adults traveling to exotic places like Marrakesh, Torremolinos, and Mozambique. Clashing cultures and social/political conflicts appeared through every part of the story and helped feed my thirst to explore, to discover, to simply find out more. I have no doubt that this book stirred the geographer deep within. I soon began my own traveling and drifting. Stretching from the shores of the Delaware River and the Mediterranean Sea in Israel, then New York and Boston, and finally settling into the edges of San Francisco Bay. There, I earned my keep rolling burritos and guiding whitewater rafting trips down blue swirling, curving Sierra Nevada rivers. It was here at the confluence of maps and travel and rivers and discovery that I began to pull it all together as a Geographer. I finished school at San Francisco State University and actually began a career in mapping, though this was a far cry from my childhood napkin skills. I dove headlong into deep geospatial technologies like photogrammetry, remote sensing, CAD and GIS. Over my career I experienced the evolution of geographic tools expanding all around me: from the early days of GPS and LiDAR to the proliferation of earth observation satellites, machine learning, and augmented reality. 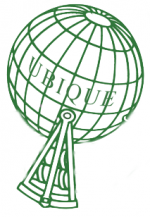 I now manage one of the largest intelligence mapping programs for the federal government, and like a kid in a mapping toy store, I get to discover, evaluate, and eventually implement many of these innovative technologies to enhance this critical program. I still get to travel and explore other places. 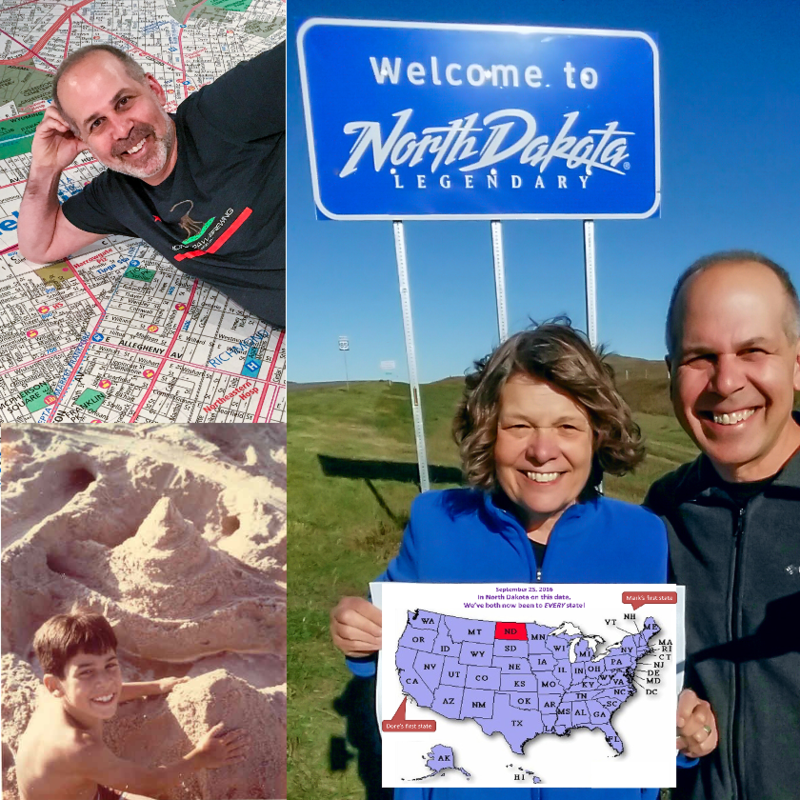 (Recently, my wife and I ticked off our 50th state.) But my yearning for discovery is now focused more on how to apply geographic principals, tools, and data to make things better. Better maps to protect our country. Better earth observation tools to protect our planet. Better STEM opportunities to promote young women in technology. Better connectivity solutions to bring people together, not tear them apart. 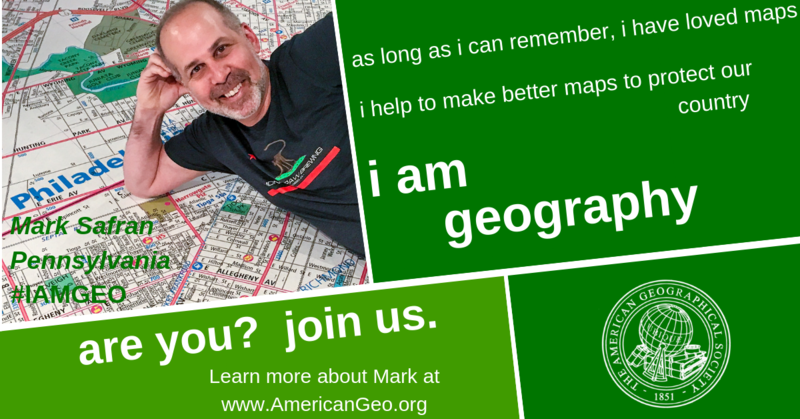 As a recently elected member to the American Geographical Society Council, I now have an even broader platform to promote these efforts. I still love maps, but I am so much more than that now. I AM GEOGRAPHY!